Between the 19th and 20th centuries, an architect sensitive to the changes of handcraft to mass production emerged. During his lifetime, the world moved from the Civil War into the Space Age. Frank Lloyd Wright (1867-1959) vision of ‘organic space’ retained the idea of enclosure and protection but offered expansive views out into the landscape. He transformed opened single spaces into a moving fluidity between and through rooms keeping a visual relationship with the natural environment outside. A key contributor of the Art Nouveau and Arts and Crafts movement originating in England, Wright celebrated new relationships between the built and natural worlds. During his 70-year career, he created over 1000 designs of which over 400 are still standing. His attempt to establish an American Style of Architecture in the MidWest, the "Prairie style” derives its imagery from the prairie. Architectural masses rise in parallel flowing horizontal steppes from the grasses. 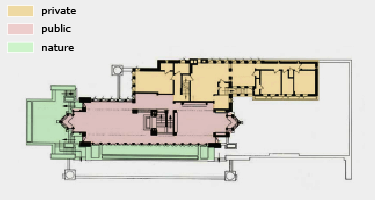 Each house he designed responded to the specifics of the site. Wright controlled the site, house, interiors, windows, lighting, furniture, textiles and murals to establish the horizontal as a line of repose and shelter while allowing for great prospect or view. His trips to Japan to design the Imperial Hotel impressed him with the Japanese house and its relationship with the landscape. The Robie House in Hyde Park in Chicago is considered the pinnacle of Wright’s Prairie House ideals. Wright believed in looking carefully at nature. 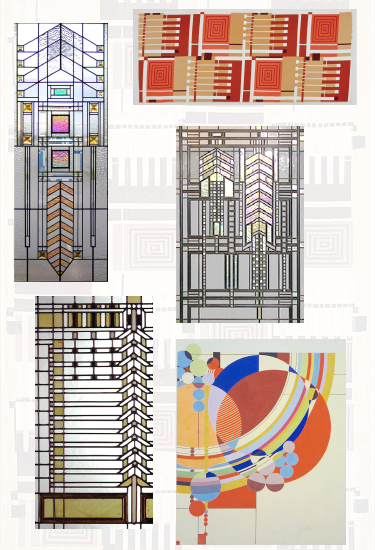 He used geometric and natural patterns in design of textiles, stained glass windows, tapestries, and carpets. Research and find three different pattern designs by FL Wright. Imagine what inspired them. Draw them. Look at some of the many stained glass windows he designed. Then use one set of organized images to structure a stained glass window. Discover how he used the same patterns for textile designs. Create your own tapestry pattern. Use the third convention to imagine a carpet and see how he used circles, squares, rectangles and triangles to create beautiful carpets. Use water color, acetate, tissue paper, colored pencils to color in individual pieces. Become a prairie pattern observer and creator! Wright grew up in the rolling hills of Wisconsin countryside. The landscape and sky became his drawing board, and the beauty of its trees, grasses, plants and flowers became part of his visual sensibility. Wright actively created a vision for American Architecture that would be part of the land and site. 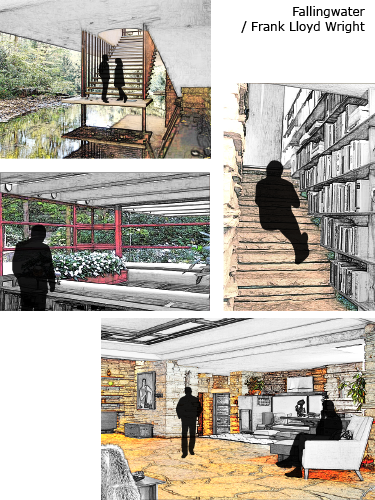 He envisioned placing spaces in direct relationship with the beauties of the site- views, streams, water, hillsides. He envisioned structures built from local, native materials that would appear to grow from the ground. Discovering a new kind of spatial flow between functional activities, Wright conceived of Prairie Architecture as a natural and easy compression and expansion of a walk in nature. Draw a Victorian House Plan and then a Prairie open plan side by side. Overlay the floor plans with a graphic of fluid space, room by room, or connecting spaces in a new organic space flow! Research Frank Lloyd Wright Prairie homes. Choose two different designs. Copy the floor plans. Color the areas(rooms) that are private on one drawing, public on the other and dot in adjacent and viewable nature areas on the third. See how people can socialize in groups or individually while communing with nature. 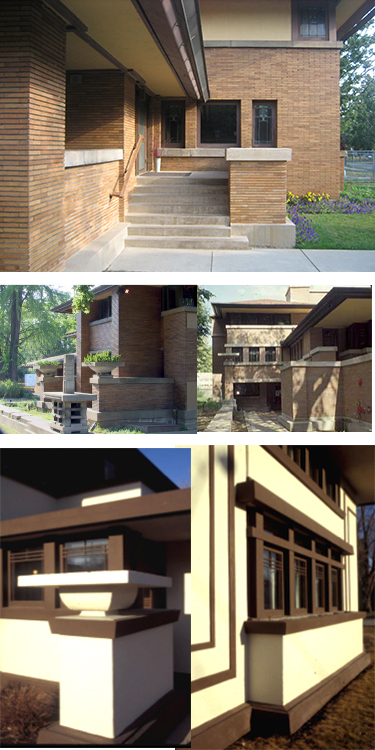 Take a look at the Robie House or the Ward Willets House. Choose one of the Prairie Homes and draw its plan and locate and label Wright’s seven points of Prairie Architecture. Prairie homes are low and horizontal. Their overhanging roofs parallel the horizon of the local landscape. Entering a Prairie House, one is often ‘compressed’ or secured in a very human-scaled entry. This entry is meant to make one feel safe as he or she enters the home as a place of 'refuge’ or security. The lower ceiling areas warmed by massive hearths set around fireplaces pull one’s focus internally. These spaces are comfortable. In addition, Wright designed other living spaces with higher ceilings and extensive views out into the landscape. 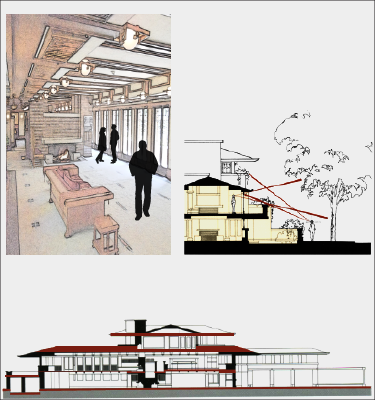 Take a look again at Wright’s Robie House or the Ward Willets House. Look closely at the floor plans and find a space that feels protected. Draw a one-point perspective of the room rendering the walls. Next find an expanse that looks out through wide windows or out onto terraces, prospecting the world at large. Draw a one-point interior of this room and compare the two interiors. Wright designed homes to parallel the horizon of the prairie. What country's architecture influenced Wright's connection to the landscape? Wright looked to what for patterns?